Cook the pasta al dente according to package directions (usually about 8-10 minutes). While the pasta is cooking, heat a large skillet over medium-heat. Add the pine nuts and toast, stirring occasionally, until golden brown. Remove from the pan and set aside. Add the olive oil, butter, garlic and onion to the skillet, and cook, stirring occasionally, for 1-2 minutes until the onion begins to soften. Drain the pasta, reserving about 1/4 cup of the cooking liquid. Add the pasta and reserved liquid to the skillet along with the spinach and kale leaves. Stir to combine until the spinach and kale have softened and begin to wilt. 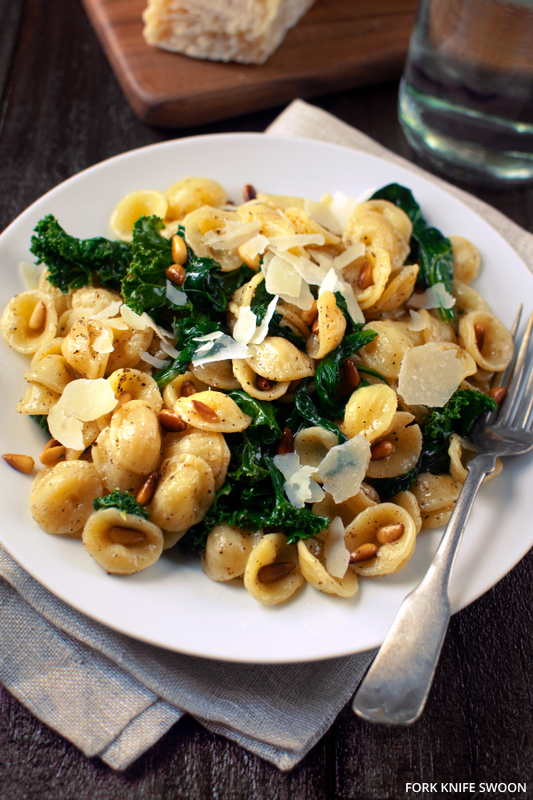 Toss the pasta with the pine nuts and Parmesan and season generously with salt and pepper. Serve immediately with additional Parmesan.